We enable you to build a meaningful life by offering our expertise in financial planning, retirement planning and financial management over time for Retirees, Entrepreneurs and Professional Accumulators, seeking to obtain lifelong peace of mind. We cater for a diverse range of client portfolios and build lifetime relationships with our clients. Through close cooperation we personalise our services and customise solutions to best fit your specific profile. Once we have developed your financial plan, we also implement and manage your financial and investment strategies over time. Important to note: we do not develop once-off financial plans for a fee. In addition to partnering with you on a professional level, taking care of your financial plan which is the enabler of your future and hence very personal, Ultima also becomes your friend, confidant, mentor and guide. 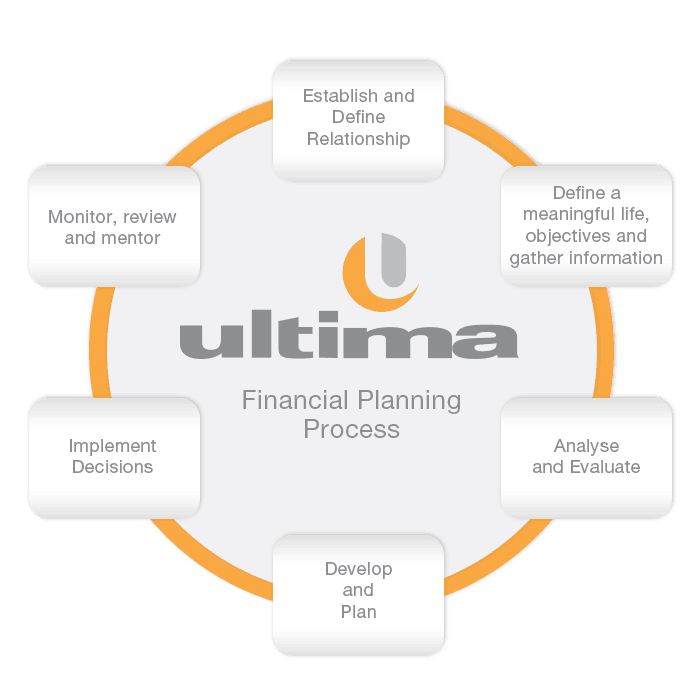 Ultima’s service offering includes comprehensive financial planning, financial advice, retirement planning and investment implementation and management. We assist you to achieve the optimum balance of investment income, capital gains and acceptable levels of risk by using proper asset allocation. This could include stock, bonds, mutual funds, real estate investment trusts, options, etc. While diversification is at the core of the strategy the funds should also complement one another and ultimately result in an approved risk return pay-off profile. Mr Page approached us for advice regarding his retirement. He was 45 years old and had belonged to his company’s pension fund for the past 20 years. He was contributing 10% of his salary of R45 000 per month to his pension fund. The resignation value of his pension fund was R1 867 000. He also had a retirement annuity to which he had been contributing R367.00 per month for the past 15 years. The underlying value was R168 400. Mr Page wanted to know if he had made adequate provision for his retirement if he planned to retire at age 65 and wanted to receive a pension of 75% of his final salary. We could easily make the necessary calculations and provide Mr Page with an appropriate answer and even proposed a couple of actions that would further improve his financial situation over time. Although the outcome could have eased Mr Page’s mind in the short-term and as a financial adviser, we would have provided a good service, such a question begs for a much more comprehensive approach. We requested more information that not only included details of Mr Page’s current retirement provision (i.e. underlying asset allocation regarding shares, bonds and property) but also addressed his future financial needs and requirements that would enable him to live a meaningful life and make his dreams come true. Based on the information received, we established how much capital Mr Page would require at age 65 to ensure a pension of 75% of his final salary, keeping in mind that the pension would also have to increase annually in line with inflation at an approximate level of 6%. His final salary would be R144 321 per month and 75% of that would be R108 240.82 or R1 298 889.87 per annum. The total capital required achieve this goal would be R21 600 798 assuming inflation of 6% during retirement, 11% capital growth and satisfying the requirement that the capital would have to last until his 95th birthday. We agreed that this level of investment would be sufficient to allow Mr Page and his spouse to realise their dreams and live the meaningful life that they envisaged. However, an analysis of Mr Page’s position at the time revealed that his pension fund (with the asset allocation at the time) would yield only R12 284 374. There would be a shortfall of R9 316 423 that could hamper the Page couple to realise the life they are dreaming of. The proposed structures would yield a capital value of R26 468 086, R4 867 288 more than would be required. If this could be achieved, Mr Page could end up with a pension of R1 591 567 per annum instead of the R1 298 889 he required. That would equate to R132 631 per month or 92% of his final salary. Without having to invest more money from his after tax income, Mr and Mrs Page could more than adequately achieve their goals. In addition to enjoying lifelong peace of mind, they would also be able to live the meaningful life they are dreaming about. The value we create through our financial expertise enables you to build a meaningful life and enjoy lifelong peace of mind.